Figure A54. Manchuria anomaly, interpreted as the Manchuria slab, with (horizontal) [vertical] cross sections through (A)[D] the UUP07 p-wave) and (B)[D] the combined SL2013 and S40RTS s-wave models at 550 km; C) the location of the modern geological record that we interpret to have formed during the subduction of the slab. 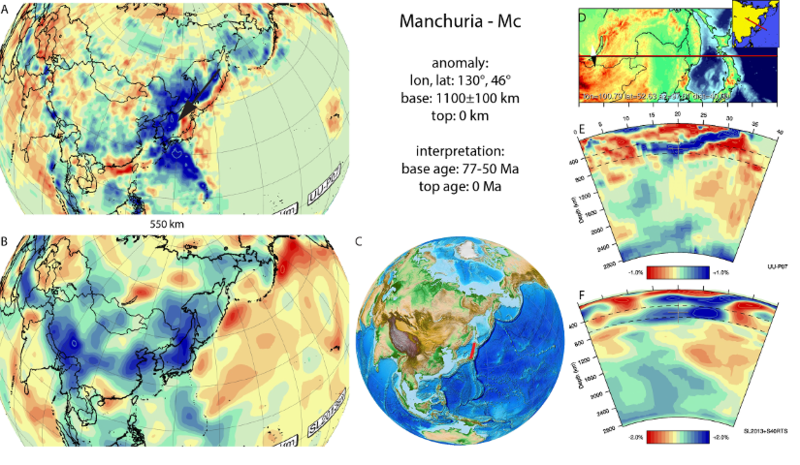 The Manchuria anomaly (Figure A54), also referred to as Japan anomaly (Obayashi et al., 2009) was interpreted as a slab that dips down westward from the Japan subduction zone at surface, drapes the transition zone below east Asia and penetrated the upper part of the lower mantle in the west (van der Hilst et al., 1991; Fukao et al., 2001; Miller and Kennett, 2006; Abdelwahed and Zhao, 2007; Zhao and Ohtani, 2009; Lei, 2012; Chen et al. 2017). In the uppermost mantle it has a N-S trend and is connected at depths of <300km with the SW-NE trending Kamchatka-Kuriles slab towards the north and NNW-SSE trending Izu-Bonin slab towards the south. It has previously been associated with westward subduction of the Pacific and Philippine Sea plate starting around 40-45 Ma (van der Hilst et al., 1991; Abdelwahed and Zhao, 2007). This timing was based on the evolution of the Philippine Sea plate only, whereas the Manchuria slab is in fact located north of the Philippine Sea plate subduction zones. In van der Meer et al. (2010), we considered an earlier, Late Cretaceous start of Pacific plate subduction more likely, indicated by a Late Cretaceous-Eocene (110-50 Ma) magmatic phase in the Korean peninsula (Sagong et al., 2005). The complications of dating this slab might be related to two ridges subducting underneath Japan as documented by Isozaki et al. (2010); first the Izanagi–Kula ridge around 120–110 Ma and then the Kula-Pacific ridge around 70–60 Ma. Ren et al. (2002) documented tectonic inversion in the Songliao Basin (NE China) at 77-67 Ma, which may date the onset of renewed subduction following ridge subduction, followed by widespread regional extension and transtension as a result of roll-back. More recently Seton et al. (2015) and Honda (2016) has the Izanagi-Pacific ridge subducting between ~60-50 Ma. On the basis of the Korean inversion and the recently modelled subduction of the last subducted ridge ,we interpret the onset of Manchuria slab subduction to start at 77-50 Ma and associate this timing with the base and westernmost extent of this slab.